Se3d peak has overlapping spin-orbit components (Δ=0.86 eV, intensity ratio=0.735). Loss feature located at 58.5 eV, visible in Se3d spectrum for metal. Se LMM peaks (between 150eV–400eV) overlap with many XPS peaks from other elements and selenium’s own XPS peaks. Selenium was discovered by Jöns Jakob Berzelius 1817 and derives its name from the Greek word “selene”, meaning moon. Although selenium is naturally found in a few rare minerals, it is primarily produced as a byproduct of copper refining. 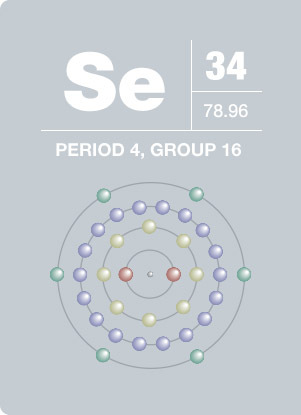 Selenium exists in two crystalline forms: crystalline monoclinic selenium is a deep red, while crystalline hexagonal selenium, the most stable form, is metallic gray. Selenium’s photovoltaic and photoconductive properties contribute to its use in photocopying, toning of photographic prints, photocells, light meters, and solar cells. A semi-conductive material below its melting point, selenium is also used in electronic applications.